How to tell if it’s a Chinese copy that people lie as Honda Win? 1. Look at the blue registration card and in case you don’t see Honda printed anywhere in the brand section then it’s a Chinese bike. 2. If the bike comes with both electric start and kick-start, then 99% it’s a Chinese. In reality, the real Honda Win comes with only kick start like in the photos on this page. We’ve seen some Chinese copy cats with only kick start but they were very old models. 3. Look at prices offered. 100-400$US range is for a Chinese bike. A working Japanese Honda Win usually starts from around 600$US to as much as 2,000$US! 4. Follow this link and look at photos. I just brought one (Honda Win 100) in Vietnam about to head north and hopefully head into Laos if I can cross the boarder. I see it’s Harder said than done. I literally got it 3 hrs ago and the language barrier was pretty bad so I would just like to confirm that its a four stroke and you don’t need to mix the fuel. If I could get a confirmation on that it would be great. Thanks in advance! Hello Steve. It seemed you didn’t know about engines, right? If you do it’s not difficult to tell. All Win’s (Japanese and Chinese) are four stroke. Your bike could be a Chinese copy (99% of these bikes bow) if you don’t see Honda printed in the blue registration card or the bike comes with electric start. be careful with Chinese copy, if it’s old your experience is more trouble than fun. You can’t expect much from a very cheap Chinese bike. Good luck. I need your help for information….. I am looking for the new speedometer and new right handle from Honda win, can you help me… maybe in Vietnam still have a brand new spare part for that. Hello Steve. We discontinued this small manual bike 8 years ago. Parts are still available but only Chinese (guess the quality). Genuine parts are expensive, even old. Sorry we don’t do anything with this model and can’t help you this time. Good luck. I recently bought a Honda Win copy and it’s running good. However, I want to learn more about basic maintenance of the bike but can’t seem to find anything specific to the Win online. Do you know the model number or is it just a ‘Honda Win’? If so, is there another, more globally popular bike that is similar that I might find some info on? Hello Filix. I owned a real Japanese Honda Win but never liked it because it’s so light and under-powered. Therefore, you can imagine my feeling for a Chinese copy! Unfortunately, we have no part or support for this discontinued model and have been quite busy that we are not able to spend sometime with you to explain about mechanic basics. Repair costs in Vietnam are not expensive but many mechanics are dishonest. Knowing some mechanic basics saves you in the long run. Good luck. Sorry mate. I should disagree with you on bigger 125 and above is needed for mountain pass. I am owner of 1999’s Honda Win100 from Indonesia. It is actually very good at handling sloopy tracks and high altitudes. The best part is it’s lightweight. You can easily drag it on turns. If you pay money and do a motorbike trip, I am sure you won’t like Win. I personally dislike the steering and feel that it’s dangerous and easy to loose control of the bike. In addition, Japanese Honda Win is a bit old now. We would prefer the new XR125L 2013/14 model. Our customers have had very positive reviews of this bike and it’s our standard and default bike option from early 2014. Top speed I ever tested was 110km/h but that’s very unstable and dangerous. Luckily, I was on a closed road. To be honest, I never like Honda Win, I would prefer the bigger GL Pro 160cc. I agree. This model shared the same engine with Honda Dream (or Astrea) but with manual clutch system. The displacement was only 100cc, it’s hard to break down a little bike like this one. If you ever head up the mountain passes, you probably need a larger bike like Honda GL Pro or Mega Pro 160cc. One thing I didn’t like on this bike is the steering which is very light and unstable. Yes, I agree, as long as it’s a genuine Honda product. 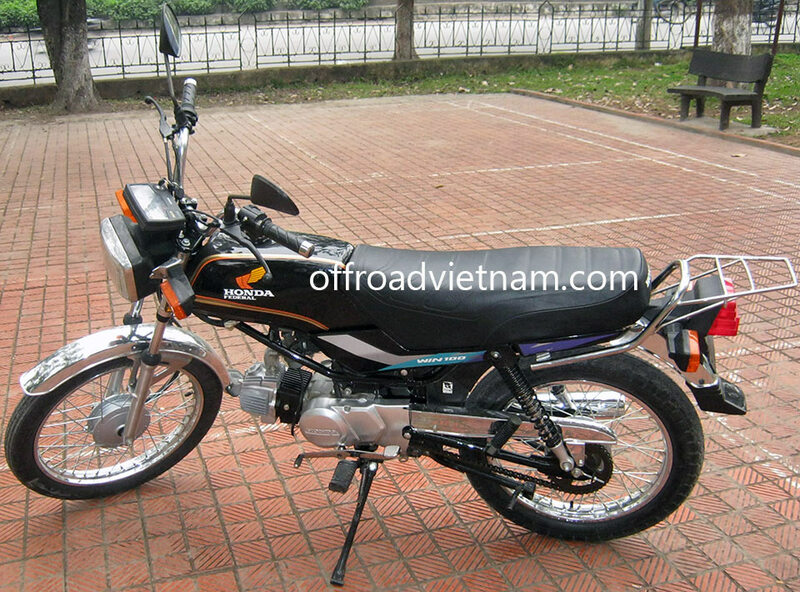 In Vietnam, there are many Chinese copy cats and they still call “Honda Win”. That’s a lie and you all know the quality of a copy cat. Honda Win from Indonesia is my personal preferred little manual bike.